latest update: 2/24/17. posted: 10/1/16. This page is a work in progress; the pieces are posted as they are completed. In hand typesetting there are three tools the compositor has handy always: pica gauge, tweezers, and bodkin. The composing stick, of course, is in hand whenever type is being set. Skilled typographers, typesetters, and compositors are constantly measuring things. In metal-type shops, the pica gauge is what they measure with. The traditional printer’s shop apron has a long, narrow pocket for a 12-inch pica gauge. The measuring starts long before the typesetting: these are layout tools, too, used in planning a typesetting job. Pica gauges are graduated in printers’ measurements: points and picas. In the traditional system reflected on pica sticks, there are almost exactly seventy-two points in an inch, and twelve points in a pica. Answering the common questions about that measurement system requires an article in its own right. Suffice it to say here that it was devloped specifically for typographic use, and is still the only practical system there is for type—metal or digital. If you don’t have a way of measuring points as well as picas, you’re pretty helpless in a composing room. The most useful kind of pica sticks (front and back sides shown here, not actual size) have, on one side, a scale in picas and half-picas and a scale in inches. On the other side, there are scales in points (two-point increments) and centimeters. Down the center of the first side runs a scale in agates, an obsolete scale once widely used for newspaper advertising. You’ll see metal pica gauges in digital environments, too, along with the usual plastic film gauges—a metal ruler has its uses everywhere. Unlike the “traditional” point system, the PostScript point system used in computer typesetting has exactly 72 points to an inch. For most purposes, the difference between the two systems can be ignored, but it can’t be forgotten. 48 picas traditional is one point larger than 4 inches; 48 picas PostScript is exactly 4 inches. On large pieces printed letterpress, this can make a difference that has consequences; once in a while the consequences may be critical, like something not fitting on a press or on the sheet size required. The stick is first set to the measure of the line width. For typesetting, the stick is held in the left hand, as shown below. The next letter is placed to the right of the first, and so on. When a line is nearly filled, the line is then “justified”: fine spaces are added so the line fills the width. The tightness or pressure of all the lines must be kept consistent, and the compositor must keep the wordspacing visually even, while avoiding bad word breaks and other faults. There’s a lot of skill to the work. The next line is set the same way, until the stick is full. The type is then moved to a galley (see below), a long tray with raised sides. The thickness of the metal back of the composing stick is the same as the thickness of the metal of the galley, so the type can be easily slid from one to the other. The next “stickful” or “stick of type” is then set, and placed in the galley after the previous one. When the galley is full, it is typically stored until all the type for the job (or the next portion of the job to be printed) has been set. The type is then assembled with any other type that goes in the job, and readied for the press. These are essential tools for the many frequently required manipulations of often tiny type and spaces, and thin leads. Type metal is much softer than steel, and bodkin and tweezers must be used carefully to avoid damage to the type, and especially to the face of the type. A bodkin is a long, thin, round, pointed steel shaft, like a big needle, that is set in a handle. The bodkin shown here is a type I’ve seen in several books and catalogs from the early 1900s. It looks very functional, but none of the bodkins I’ve used have looked like this, and I don’t know if this configuration has any special merits for type, or if it was considered canonical. Certainly, anything with a handle of suitable size, and a suitable point and shaft, has been used and will work. Compositors in earlier times made their own bodkins. A tweezers is a tweezers. Specimen books are also essential composing-room tools. For much more about type, see the Type & Typefaces and Type Technology sections of this site. Wood type was the vehicle for the large and often fanciful display faces for which the 1800s are famous. It continued in use through most of the 1900s. For much more about wood type, see the Notes on Wood Type page. For much more about spacing material, see the The Space Page. A galley is a shallow tray used for storing type. After type is set in the composing stick, as described above, the type is moved into a galley. Galleys are also used for long-term storage of type after it has been printed—if the shop can afford to have type standing unused, and there is enough of each font left in the case for other work. Other typographic material (see below) may also be permanerntly stored in galleys. Galleys were made in a number of widths and lengths. Many were longer than the one shown above. 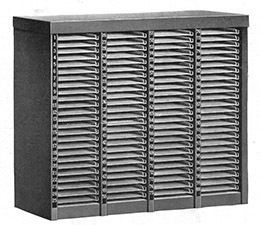 Cabinets like the one below are used for orderly storage of galleys. Each shelf typically has a number next to it.